Note: I assume no responsibility for anything you do with the information on this page. If you blow up yourself or your dog, if your wife divorces you for doing this on the kitchen table, if your boss fires you for doing it on company time, or if you starve somewhere on the PCT because the thing fails you miserably -- well too bad. Consider yourself warned and me indemnified. This stove is very similar to other soda can stoves, except that the fire ring has a smaller radius than most. The edge on top is also very durable; it doesn't bend easily (but if it does you may be in trouble). The unit's performance will vary depending on your choice of can, the size and layout of your pinholes, what kind of insulation you use (or none), the height of the sides, and so forth. I have not tested this design with a view to providing an optimal configuration (even for myself). I'm hoping others will do that (sparing me the effort ;-) and will email their results to me. 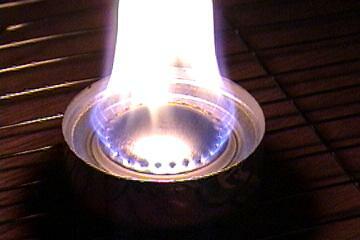 If you're looking for the Hyperlite Finger Stove, well, click this. Lookin' for a better mousetrap? 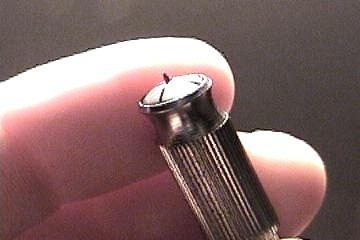 For poking the pinholes, I use a pin vise with the needle sticking out just a wee bit. That way I can push the pin vise all the way against the can surface, ensuring uniform hole size. I also sharpen the pin with a file, to make it smaller. I've also used the pin vise with tiny drill bits. See here. Holes created in this way are much cleaner, and lack the dimpling effect of needle-punched holes. The first step is to create a top and a bottom using typical methods. See the excellent instructions that first got me interested in these things (many thanks to Scott Henderson). 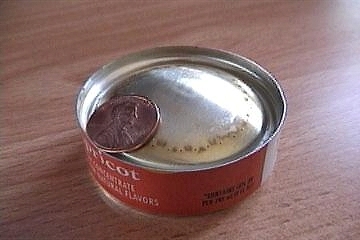 You can use any soda can, the smaller Mott apple juice cans or (smaller still) the V8 or apricot nectar cans. 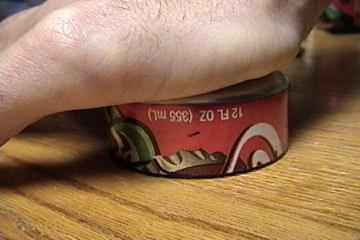 Note, however, the way the top can is cut, and the way the holes are placed. This stove has a smaller flame circle, because the holes are punched on the convex surface of the top can. 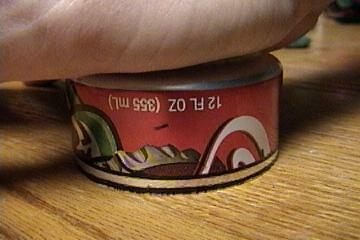 Also, the two cans are cut taller than need be. 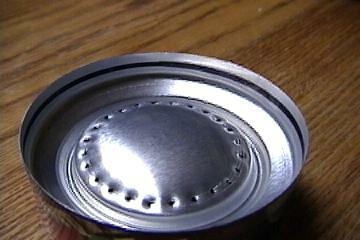 Be sure the convex dome of the top can is beneath its outer edges. Material may be trimmed off when the stove is fully assembled. Note that I've added fiberglass insulation, and a piece of fabric window screen. It's not tightly packed. 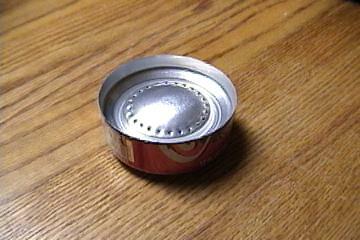 After placing the top can on the bottom can (remember -- convex up! ), invert the stove on a smooth horizontal surface. The almost-finished product. Note that the sides are a bit high. Use a marker and create a line around the inside (or outside) of the rim of the stove, where you want to trim excess material. You better leave at least 1/8" of vertical wall, though. 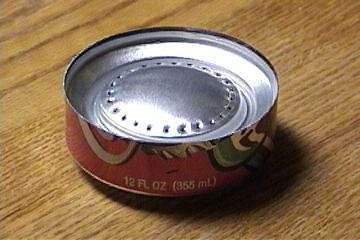 I'd suggest nearly 1/4"
Trim along your line with a scissors, being careful not to warp the can or stretch the aluminum where the top can is concentric within the bottom one. At any rate, once you've filled the stove, you'll have enough fuel left in the top section to preheat the thing. You could spill a little fuel down the outside to speed things up, if you have a surface that's reasonable for that. Note: Just for fun, I placed the stove on an ice block while it was running, and it immediately went out. Instantly. So don't count on this thing unless you have a way of insulating it from cold surfaces underneath. Note in the stove at left (a Coke can), the flame is a bit far from the edge of the can for efficient transmission of heat to aid in vaporization of the fuel. I heartily recommend the Mott apple juice cans, which are smaller but not as small as V8. 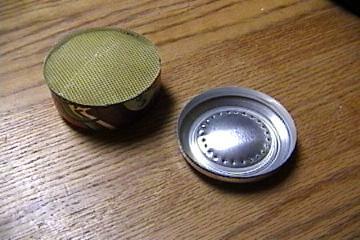 Addendum: Below is a picture of this same approach, using a V8 style can (apricot nectar). The holes in this unit were drilled using a pin vise with a .0135" #80 bit (a good hobby store will have these). This is much smaller than pinholes. It works very well; I think I'm done forever with the pin method.